The man is being held at Antrim police station in connection with the incidents which occurred in the Ardoyne area last Thursday. 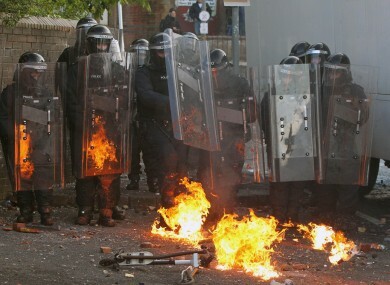 Protesters clash with police in Ardoyne following an Orange Order parade in North Belfast last Thursday. A MAN HAS been arrested in Belfast in connection with the attempted murder of police officers during the violence which marred last week’s Orange Order marches. The man, 33, has been taken to Antrim police station where he is being questioned by officers from the PSNI’s Serious Crime Squad in connection with the matter. Police in the North say there are no further details at this point. Nationalists and loyalists clashed on the streets of north Belfast last Thursday night as the Orange Order paraded through the area to mark the Twelfth of July. Petrol bombs, pipe bombs, bricks and bottles were thrown at police officers while shots were also fired. In total, 20 PSNI officers were injured in the violence. Email “Man held over attempted murder of police officers ”. Feedback on “Man held over attempted murder of police officers ”.